Description: For almost a half a million years, the Neanderthals and their ancestors survived the harsh climates and low ecological productivity of Ice Age Europe. Survival in glacial Europe required diets that had a high percentage of meat, since much of the plant growth during cold periods was not humanly edible. This necessary dependency on meat and other animal tissues put the Neandertals into direct competition with a diverse cast of large-bodied carnivores, including cave lions, scimitar-toothed cats, leopards, cave hyenas, wolves, dholes, cave bears, and brown bears. 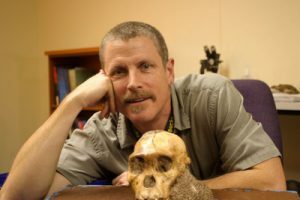 Given what can be inferred about Neanderthal body size, social group size, and weapon technology, it is likely that Neandertals were competitively disadvantaged relative to the larger social carnivores of the Ice Age carnivore guild – namely cave lions, scimitar-toothed cats, and cave hyenas. Because competitive dynamics within the carnivore community – both exploitative competition over resources and interference competition involving hostile interactions between species – have a major impact on carnivore demography, competition may in part explain why Neandertals lived at very low population densities throughout their tenure in Europe, and their ultimate extinction.